A stop sign at Ladd Circle. The Portland Police Bureau is all set to do a targeted enforcement mission at Ladd Circle today. The action comes after they received complaints from area residents about people rolling through the stop signs. As regular readers of this site know, this issue has plagued road users in this southeast Portland neighborhood for many years. We first reported about police activities at these stop signs in April 2007. Since then, the lack of compliance and resulting frustration from neighbors who say they’re afraid to walk around the circle and from people who feel the enforcement is unfair and a poor use of police resources, has continued. On Monday, we received a phone call from PPB Traffic Division Lieutenant Chris Davis. He said he plans to send several officers out for the mission. “We’ve been getting complaints again of people running stop signs out at Ladd Circle,” said Lt. Davis. 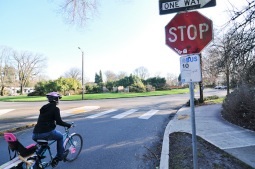 “We’re having the same issues with bikes and cars running the stop signs.” Lt. Davis said now that school is back in session, the bureau’s biggest concern is the safety of people walking in the area. The scene at Flint/Broadway last week. Once again, two of the city’s most infamous stop sign locations are being targeted by the Portland Police Bureau (PPB). This morning, and two other days this week, multiple motorcycle cops have stationed themselves at the intersections of N. Flint and Broadway and SE Ladd Ave at the circle. These locations have gotten bicycle-focused police attention for many years, but the behaviors that bring them there — a high rate of non-compliance by people riding bicycles — continue to be problematic. Stop sign at Ladd Circle. 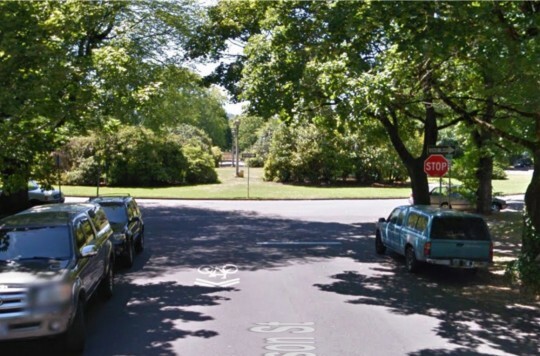 Ladd Circle has been a thorn in the side of neighbors, vehicle operators, and the City of Portland for years. The circle — which happens to sit on one of the most heavily traveled bicycle corridors in Portland — has stop signs at every entry; but they’re notoriously ignored. “Ladd Circle is a memorable landmark in the Hosford-Abernethy neighborhood and during commuting hours can be a very busy thoroughfare. Thousands of cyclists, drivers and pedestrians make their way through each day. 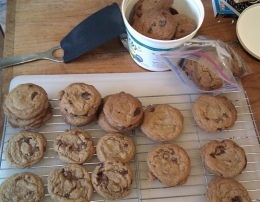 After reading and thinking about the latest debates over the stop signs at Ladd Circle, 24-year old Sellwood resident Joe Hand decided to take the issue into his own hands — or should I say, into his own oven. The infamous traffic circle in Ladd’s Addition seems once again poised for headlines. The circle — which has frequently ignored stop signs at each entry point — is on one of Portland’s busiest bike routes and it has been the sight of numerous police enforcement actions (a.k.a. “stings”) over the years. trap discovered at Ladds Circle! 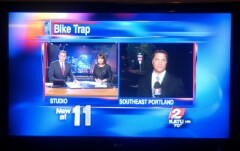 What started as a post to the Shift email list at 1:30 am yesterday morning has become the latest headline-grabbing story in Portland’s ongoing fascination with the “bikes versus cars” dichotomy.